A snapshot of Ergoweb’s home page in 1994. January 2015 marks our 20 year anniversary as a commercial company, and our 23rd year of delivering ergonomics software, information and services to the world (those first few years were spent at the University of Utah, where we built our early Web sites and applications). What a ride it’s been. We’ve achieved many “firsts” along our path. It’s hard to believe now, with nearly all software becoming subscription based (SaaS — software as a subscription, or “cloud-based applications”), but our Job Evaluator Toolbox™ (JET™) was one of the very first commercially available SaaS products in the world, let alone in the ergonomics arena, way back in the mid-1990’s. For perspective, that’s when Yahoo! was just getting started, several years before Google came online, and waaaaay before company’s and web sites like Facebook came along. We don’t have the mass appeal they have, but we’ve served many millions of pages to many millions of people during the past 20+ years, and we’ve assisted countless companies and individuals improve their work and well-being. 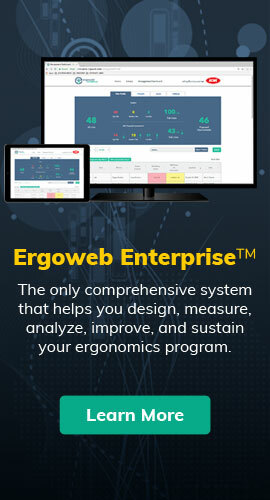 Our ErgoAdvocate® office ergonomics system and Job Evaluator Toolbox™ (JET™) softwares, the information we share through this Web site, ergoweb.com, and our equipment partner, Ergobuyer®, now deliver the benefits of ergonomics to companies around the world, improving their performance and that of their employees. We recognized early on that the Internet and the Web was to be a game changer for human factors and ergonomics, which is to say, a game changer for the way humans interact with information and technology. We knew the web could empower individuals and organizations to continuously improve, expand knowledge and responsibility, and better integrate and aggregate the various factors that contribute to system performance, organizational success and human well-being. In the early 1990’s, the Internet and the Web gave the world the foundation for a set of new and powerful tools. We took a big risk back then by embracing and pioneering these tools for ergonomics knowledge and applications, and though there’ve been bumps and detours along the path, we’re sure glad we did. Thanks for all your support over the past 20 years — here’s to the next 20 years — Cheers from Team Ergoweb!